property for sale or rent? Now’s the time to open your door for a chance to spin and win! The Elders Real Estate ‘Chance to Spin and Win’ promotion (Campaign) commences on 10 September 2018 at 12.00am CST and closed on 22 November at 1159pm CST (Promotion Period). The promoter is Elders Rural Services Australia Limited (Elders), ABN 72 004 045 121 of 80 Grenfell Street, Adelaide, SA, 5000.
vi. the appraisal referred to in paragraph 3.v be completed during the Promotion Period. Clients will receive one entry into the Campaign for each property that is appraised where the eligibility criteria in paragraph 3 is met. The total prize available is worth $255,000. iii. $10,000 Flight Centre voucher. If the prize winner has also exclusively listed their property for sale or rent through Elders Real Estate during the Promotion Period they will automatically receive a $5,000 visa cash card in addition to the prize won. i. Eligible clients will be entered into the draw to win a chance to spin and win. ii. A draw, completed by an online electronic draw system, will be held on 28 November 2018 at 11am CST at Level 10, 80 Grenfell Street, Adelaide SA 5000 and an entrant will be selected to have a chance to spin and win. The draw winner will be notified by email and/or telephone on 28 November 2018.
iii. The winner of the draw referred to in paragraph 8.ii above will then have the chance to play the spinning wheel game at their closest Elders Real Estate office on 10 December 2018 at 2pm AEST. The draw winner will be required to make their own way to their nearest Elders Real Estate office at their expense. iv. All draw and redraw information will be communicated via the campaign website. Prize winners will also be advertised via the campaign website. v. Where the winner fails to claim the prize by 12 December 2018 or forfeits the prize, a further draw, completed by an online electronic draw system, will be held on 28 February 2019 at 11am CST at Level 10, 80 Grenfell Street, Adelaide SA 5000 and an entrant will be selected to have a chance to spin and win. 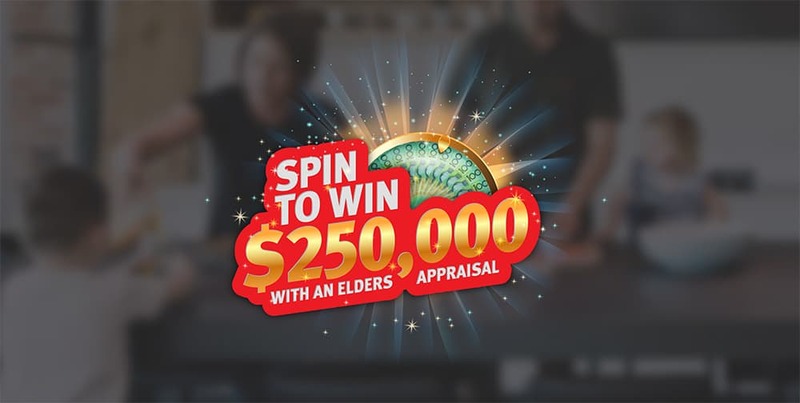 The winner of this further draw will then play the spinning wheel game at their closest Elders Real Estate office on 14 March 2019 at 2pm AEST. vi. If proposed prize money is greater than $2000 the prize winner must be paid the amount exceeding $2000 by a crossed cheque made out to the winner (or by EFT if the winner so requests). The full prize amount can be paid in this manner, if desired. vii. In a draw where the total value of the prizes is greater than $10,000, the draw and the announcement of the prize winner(s) must be scrutinised by an independent person. Elders reserve the right to confirm all entries to the Campaign are valid and seek further confirmation from entrants if required. 10. Elders and its agents are not responsible for lost, illegible, misdirected, incomplete or damaged entries. Elders or other service providers are not responsible for incorrect or inaccurate transcription of entry information; human error; technical malfunctions; lost or delayed entries. Any liability of any of the above persons for any incidental or consequential damages, however caused, whether in contract or in tort, arising out of this promotion or use of entries or prizes is expressly disclaimed and excluded. 11. Elders’ invitation to participate in the Campaign is not transferable, nor redeemable for cash. 12. Elders’ decisions in relation to this Campaign, including the eligibility of transactions to participate in this Campaign are final and no correspondence will be entered into in relation to them. 13. The winner is liable for any taxes, levies, duties and registration (if required) resulting from participating in the Campaign or receiving the prize. 14. Elders and its agents will not be liable for loss, theft, or misuse of any cash payment or property damage, personal injury, or misfortune in any way attributable to the Campaign. 15. Elders and its agents will not be liable for any loss or damage arising from the purchase or use of any eligible product purchased under this Campaign, other than to the extent required by law or any other terms and conditions entered into between the entrant and Elders for the sale and purchase of farm supplies. 16. All entries become the property of Elders. The entries may be used by Elders for future promotional, marketing and publicity purposes unless otherwise stated by the entrant. 18. Employees and agents of Elders (and its related bodies corporate), and their immediate families, associated companies and agencies are not eligible to enter the Campaign. iii. related to the participation in the Campaign. 20. Any dispute arising out of or in relation to the Campaign shall be governed by the laws of South Australia. 21. The Campaign is authorised under NSW Permit Number LTPS/18/27402, ACT Permit Number TP 18/01575 and SA Licence Number T18/1444. 1. The Elders Real Estate ‘Chance to Spin and Win’ promotion (Campaign) commences on 10 September 2018 at 12.00am CST and closed on 22 November at 1159pm CST (Promotion Period). 2. The promoter is Elders Rural Services Australia Limited (Elders), ABN 72 004 045 121 of 80 Grenfell Street, Adelaide, SA, 5000. 4. Clients will receive one entry into the Campaign for each property that is appraised where the eligibility criteria in paragraph 3 is met. 5. The total prize available is worth $255,000. 7. If the prize winner has also exclusively listed their property for sale or rent through Elders Real Estate during the Promotion Period they will automatically receive a $5,000 visa cash card in addition to the prize won. 9. Elders reserve the right to confirm all entries to the Campaign are valid and seek further confirmation from entrants if required.